Desire Peaks, the debut solo exhibition of Royal Academy graduate Hannah Bays at Cob Gallery, was received with rave reviews. 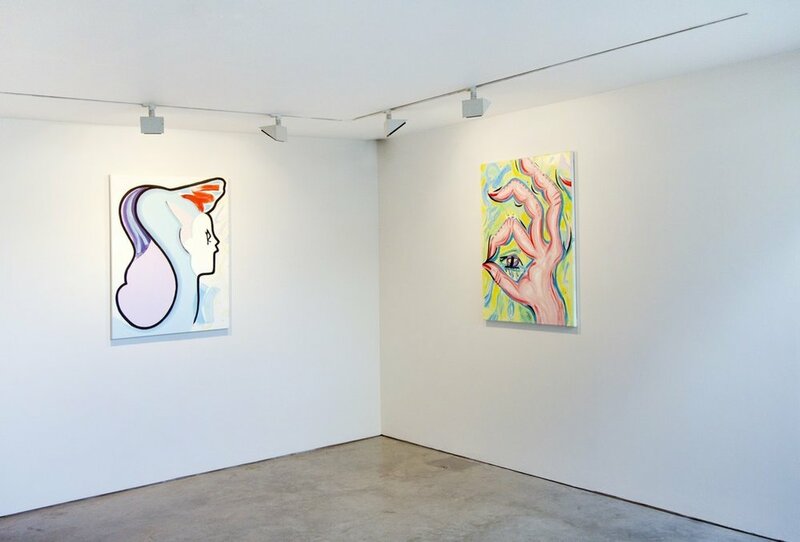 The show definitely stirred the senses with its bold thick strokes and vibrant color scheme, flowing cohesively to create a distinct body of work. 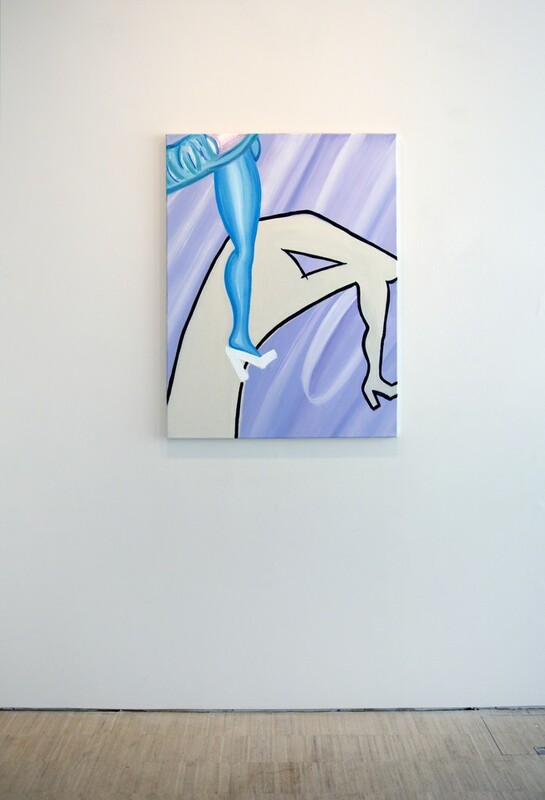 Aesthetically Bays’ work has been “conflating and distorting everyday graphic signs and symbols in a way that playfully elucidates.” This take on common signs is prevalent in Desire Peaks with pieces like "Dollr," showcasing a contorted body limb money sign. Of her next collection Bays is “making a series of paint drawings on board on the floor, leaving in all the dirty finger marks, crumbs, and footprints.” This new project is a contrast to Desire Peaks’ glossy output and is equally anticipated. Bays clearly has a concise point of view and a message to be conveyed to the art world through each brush stroke. I usually position myself in a post-pop vein, often considering ‘desire’ and the gap between desirability and attainability within my work. I combine pop-cultural idioms alongside the art historical, with recent works conflating and distorting everyday graphic signs and symbols in a way that playfully elucidates. There's often a quiet sense of discord or unease beneath a seemingly harmonious façade, and the coexistence of contrasting plastic and organic forms that maybe shouldn’t fit together cohesively, but are assimilated into one style. The use of color to transmit ideas and energy is important. That which stirs the senses. Justice, altruism, harmony. Have you experimented with other mediums other than oil paint? I'm doing some basic experiments with plaster, which I’ll then paint on, as a way of getting beyond the tyranny of the rectangular support, but up until now I've been perfectly happy within the parameters of the stretched canvas. I started out using a mixture of collage, paint, pencil, any drawing material I could get my hands on - blood, wine, coffee, whatever – but that was a long time ago and now it tends to be mostly oil paint. If you could describe your painting style with one word what would it be? Do you think female artists are still marginalized? There is much to do in the reappraisal and rewriting of history in terms of women, but conditions do seem to be improving. The market says otherwise, but I’m heartened by the way things are developing. Most of my favorite current artists are women - a testament to the abundance of contemporary female artists undeterred by the situation. How do you feel about the current political situation in Britain? I can't seem to find a silver lining to the depressing state Britain finds itself in. People can be so easily swayed by the fear-mongering rhetoric of our so-called newspapers - many of which are partisan, flagrantly pursuing their own political agenda (see those owned by Rupert Murdoch, who has power far beyond what’s appropriate). I think this factor has a lot to do with the recent EU voting outcome. That said, many people of England in particular clearly feel disenfranchised and their votes speak of this. Current world events have lead to an increase in ugly racist forces in Britain, as elsewhere, which is horribly worrying. Does each of your paintings symbolize a particular theme in our modern day culture? Each painting has a unique sensibility yet shares themes and traits with others. I do like to explore different ways of depicting the same thing, not least to keep myself interested but also as a nod to divergent voices and possibilities. There are multiple viewpoints in life as in art, and as someone with a hearty ability to empathize - this is something I consider. I see each work as a personality within a family. I’m looking forward to a couple of residencies over the next year or so - one in Britain, one in France. Also some group shows in the UK this autumn, one of which is called ‘Integrity Painting Prize’ which will be held in Fulham, London. How do you think you have evolved as an artist since your days at the Royal Academy of Arts? It's a year since I left the RA and I've continued to develop although I do miss the academic element and the lavish luncheons. That said, the RA students are a tight-knit bunch and many of us share studios together in South London, so we’ve built on and continued the experience. It’s nice to be able to keep my own studio hours and work without so many daily distractions. Privacy is important. Does most of your inspiration come from your personal life or from matters in our society? There are certain societal themes that I’m concerned with - capitalist ideology, identity, desire, but painting is a convoluted process not simply the visual portrayal of an idea. Formal concerns, philosophical musings, minute observations are all in the mix but it’s important that there is an allowance also for deeper, less voluntary forces to come to play. It is often through what Guston called ‘the third hand’ that the real meaning of a work emerges. The moment when the painter’s conscious demands on the work are overpowered by ‘the third hand’ that takes over the act of painting, giving rise to the true nature of a work. I don’t set out to tackle the personal - interested in broader themes, but am of the belief that the personal is political and therefore vice- versa. To paraphrase Brian Eno, who paraphrased the writer Morse Peckham, in a recent lecture on Culture - Art allows for exposure to the tensions and problems of a false world in order that man may endure the tensions and problems of the real world. This applies also to ‘joys’ and ‘freedoms’, so that we might recognize these and locate them in the real world. I think this is particularly pertinent to the act of painting. I’m making a series of paint drawings on board on the floor, leaving in all the dirty finger marks, crumbs and footprints that might have accidentally found their way in. This contrasts with the more glossy output of my recent show Desire Peaks. I’m currently interested in the vestiges of mythology in the modern day - how we are all unwittingly reliant upon myth, integral as it is to social structures and ideology; looking particularly at the mythic in the everyday. A new body of work is emerging.